The fact is, that most everyone wants to be smarter. If you are a life-long learner, like me, then it is fun to find new ways to stretch yourself. But can you actually increase your intelligence? The answer — YES! And you can do it through creative writing. Here are some facts about intelligence to help you understand (from American Scientific Magazine my inspiration for this post). The more you challenge yourself, the better your brain will work. Anyone can increase their intelligence. Yes, everyone. Exercises don’t need to be traditional. So, how does this apply to you? According to American Scientific, you can do five things to train your brain. I’ve been hoarding pictures again and thought I should share a few. May they be a muse to your writing fancies. Have you noticed the growing number of articles that offer a reading time? Recently, I’ve even seen some people put a reading time on FaceBook posts. You may have wondered about the easiest way to add a reading time to your blog posts and articles. Or, maybe not. Ha. If you did, here are the easiest methods. The average person reads 200 wpm (words per minute). So, base your calculations on this. 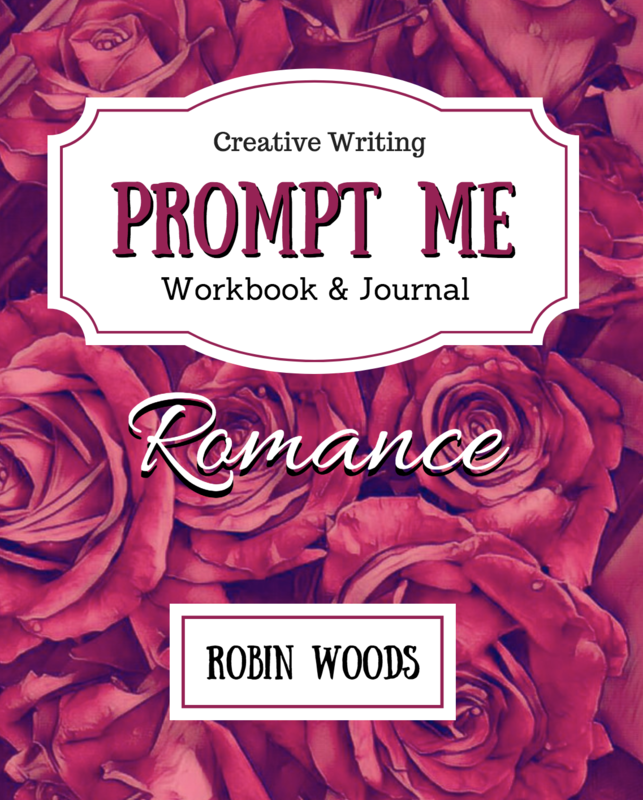 I’m super excited to announce the release of Prompt Me Romance. This creative writing workbook and journal is clean enough for teens but sophisticated enough for adults. Whether you are just starting out or have a string of published books, there is something in here for you. All new photo prompts, first person, third person, fill-in-the-blank, master lists, and much more. 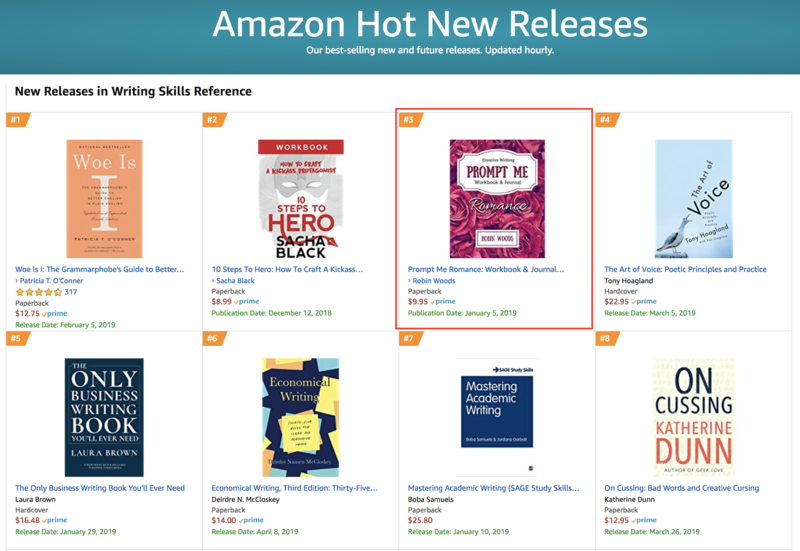 I was thrilled when it debuted on Amazon’s “Hot New Releases” and may have done a really awkward dance in my living room (but there is no way to prove it–all video mysteriously “disappeared”). So check it out. I have samples and a freebie master list below. Enjoy! 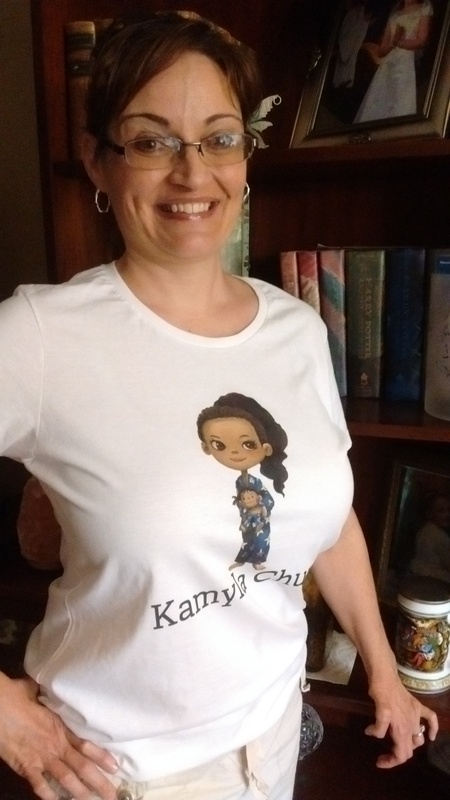 Welcome to my blog interview with novelist, Ellwyn Autumn, author of The Kamyla Chung Series and Chris Kringle’s Cops The First Mission. Ellwyn Autumn is an American author/blogger/ghostwriter and a certified teacher with a Master’s Degree in Education. She writes children’s picture books, middle-grade novels, and Young Adult fiction. Ellwyn’s first self-published novel, Chris Kringle’s Cops The First Mission, was a finalist in the 2016 Reader’s Favorite International Book Contest. Her Kamyla Chung picture book series addresses difficult issues facing young children. Kamyla Chung and the Classroom Bully is on Jedlie’s Certified Great Reads List and earned Story Monster Approval. Ellwyn discovered her passion for writing in second grade when she had to write a book report for school. She was so excited to write the report, until her mother told her that she had to write about someone else’s book and not her own story. Ellwyn became indignant and decided that once she finished the book report she would most certainly write her own original story. She has been writing ever since! She lives with her family in Pennsylvania. She loves all things magical, curling up with a good book, writing stories, and almost anything with chocolate in it. When I was seven years old. What inspired you to write your first book? My son inspired my first published book. When he was little I used to tell him and his friends that I was a secret agent for Santa Claus. Shortly after I envisioned, Agent 12-25, and the story came to life. What is your work schedule like when you’re writing? It depends on the day. During a good week, usually several hours every day. This may also include marketing. What would you say is your interesting writing quirk? That’s a good question. I like rhyme and alliteration. I try to weave humor and sarcastic characters, that have a certain vulnerability, into my stories. I want to show the humanity beneath their salty exteriors. I strive to write stories that will make people laugh and empathize with the characters as they overcome difficult obstacles. 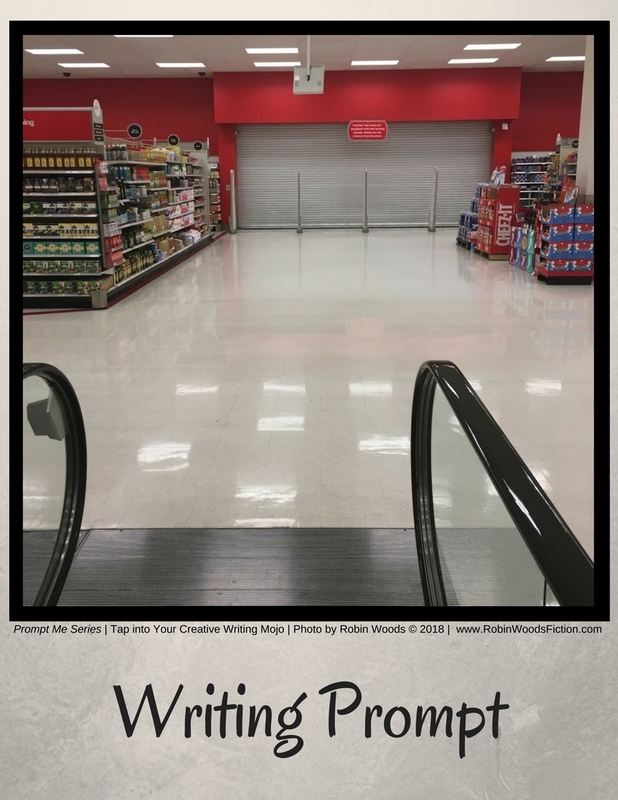 It is my pleasure to announce the newest edition of the PROMPT ME SERIES. Woo hoo! 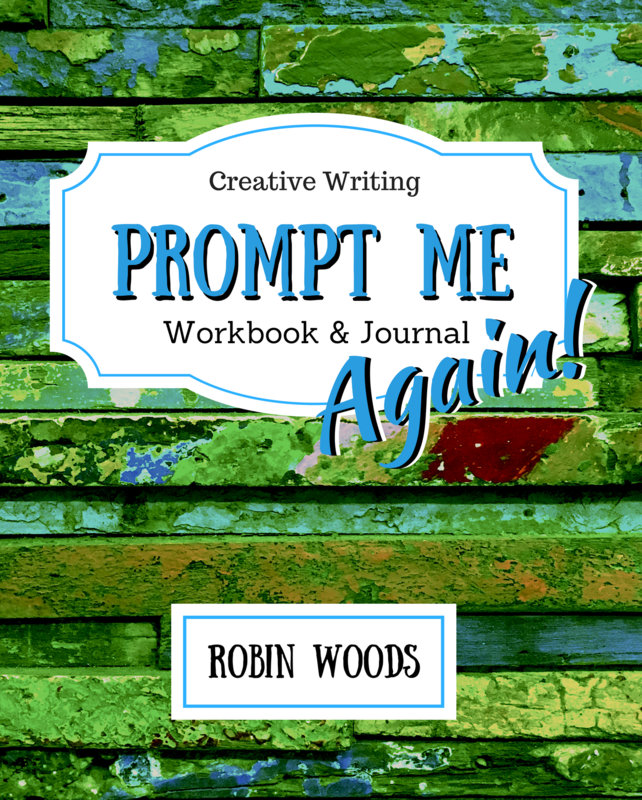 Prompt Me Again is full of new prompts and ideas to get (and keep) you writing. I had a ton of fun taking all the new pictures. I went so far as getting into a pool fully clothed (with my friend, Jenn) and capturing some eery images. I also found myself wading through waist-high grass (in flip-flops) while getting eaten by mosquitos to nab the perfect sunset pic. And…it was all worth it. As an aside, both of my editors faves are the “Fairy Tale Mash Up” and the “Facial Expression” reference chart. Regardless, there is something for everyone in the book. Here is a glimpse of what you get in this new installment. Clean enough for teens and sophisticated enough for adults. Add it to you TBR list on Goodreads here. Prompt Me Again on Amazon. Because you asked…more Prompt Me books are in the works. 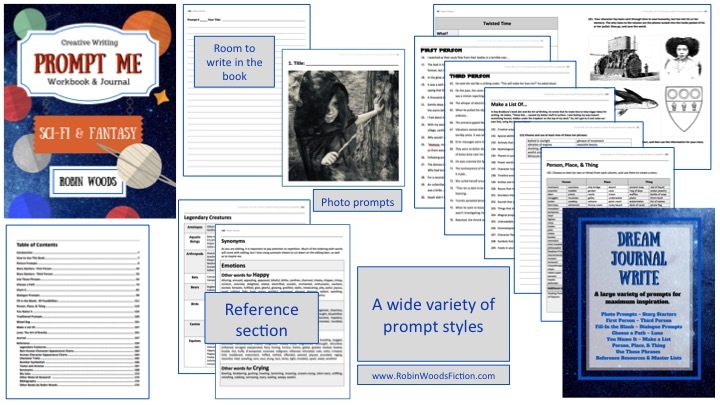 Current Projects: Prompt Me Romance (Feb. 2019), Prompt Me Classroom, and Prompt Me Kids Edition. It’s less than two weeks until the release of Prompt Me Sci-Fi & Fantasy. So here are five more photo prompts to keep you going until then. Happy writing! 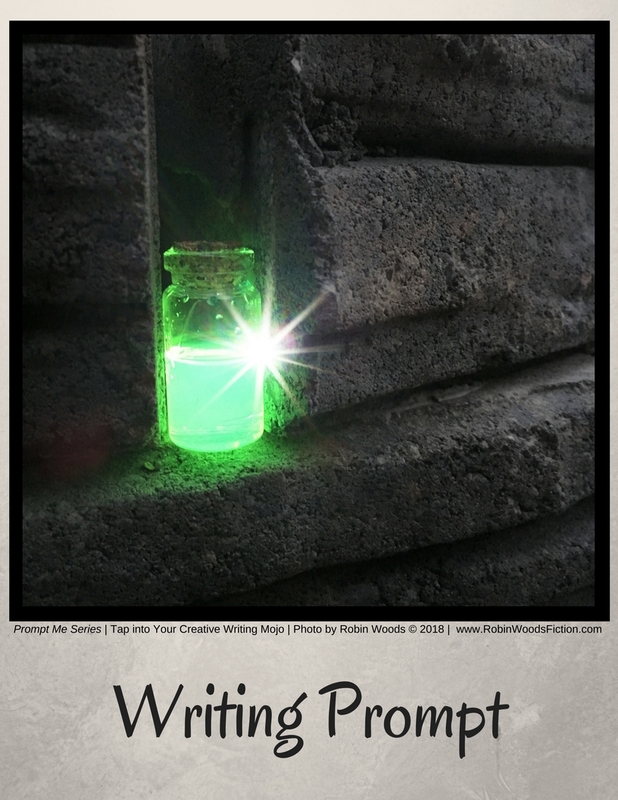 The countdown for Prompt Me: Sci-Fi & Fantasy Workbook and Journal continues. 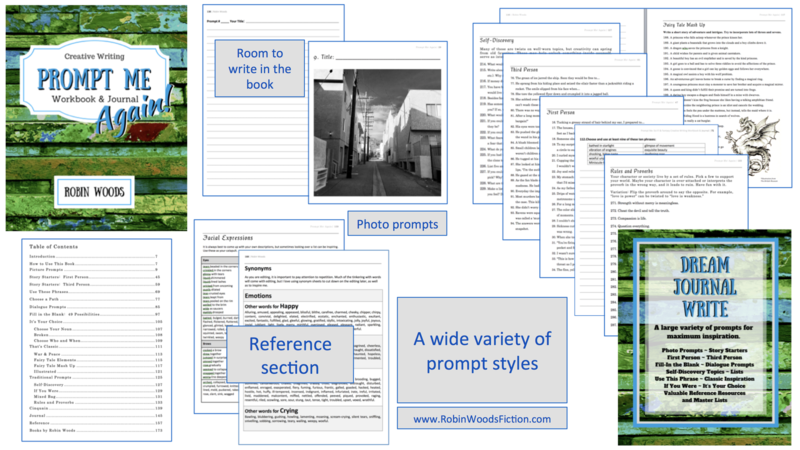 Here are five more photo prompts AND a full page from the workbook to tide you over. 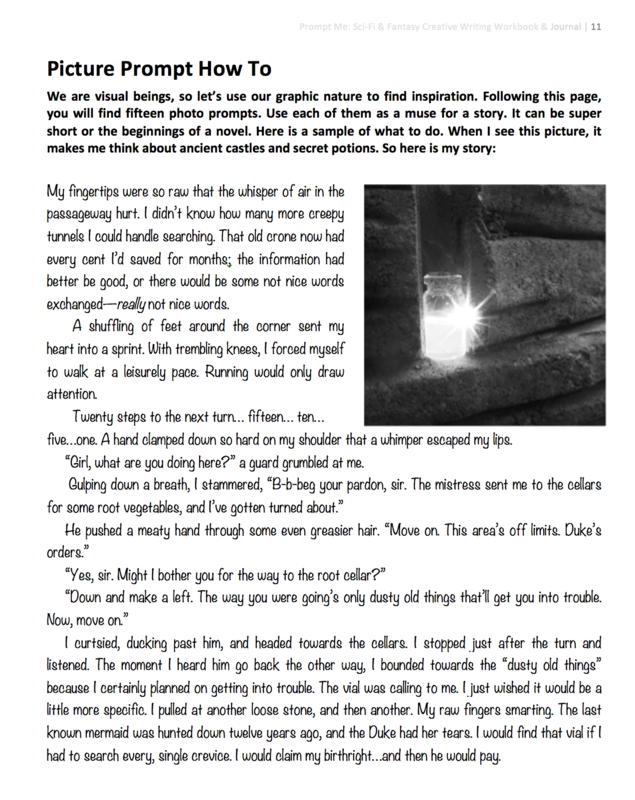 No, I’m not giving you a full page of prompts, but I am giving you a mini “How To” with a sample story. Enjoy! The following prompts do not appear in the workbook. With my upcoming Prompt Me: Sci-Fi & Fantasy release this February, I want to celebrate by releasing a series of photo writing prompts over the next couple of weeks. Here are five of my favorites. I hope you enjoy them as much as I enjoyed taking them.